Four old school crime gang members meet for their weekly poker game. But one of them who got fatheaded now has a bodyguard. The new addition turns out to be a total idiot who says aloud everything he is going to do. It ends up being quite annoying in the alcohol-ladden velvety atmosphere of the surroundings framed by the habits of the team’s veterans. These congenial bad boys are Raoul (Luc Le Clech), Marcel (Patrick Fautrat), Dark Glasses (Patrice Gaudin) and they are joined by Paul (Philippe Lombard) and his idiotic sidekick Norbert (Yannick Guigneux) at the beginning of the story. Wrapped by Eric Saussine, this new comedy reunites the team from Picnic. All members were happy to be part of these new highly referential movie buffs’ ravings. 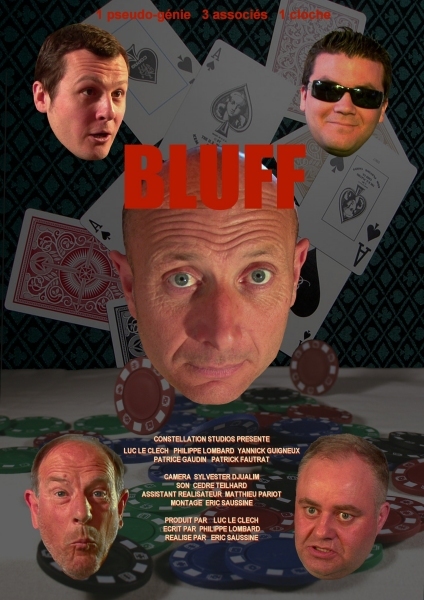 Download BLUFF (DivX format, 135 Mo) Right-click on the above link et "Save target as..."